An extended workshop, where some concepts will be presented (improvising, chord theory, guitar technique, how to practise) and others explored depending on the students’ questions. Add interest to your playing with elegant departures from the norm. Learn to use more interesting chords to colour outside the lines, and let your ears guide your fingers. We’ll immerse ourselves deeply in the guitar world and go where the music takes us. 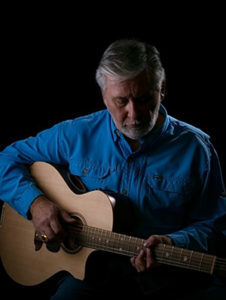 Jim McLennan’s reputation as a fingerstyle guitarist, composer and arranger has produced an enduring legacy as one of Alberta’s finest guitarists. He recorded for Stefan Grossman’s iconic Kicking Mule record label in the 1970s, and has been featured in Guitar Player magazine. Upon its release, Jim's solo CD, Six-String Gumbo, was chosen "CD of the Week" by CKUA Radio. The CD was a Western Canadian Music Award finalist for Instrumental Recording of the Year. Jim occasionally performs solo, but most often in a duo with his wife, vocalist Lynda McLennan, or in the trio, Western Spirit, with his brother Hugh McLennan and Mike Dygert. Jim has also appeared in performance or on recordings with John and Caroline Fraser, Amos Garrett, David Wilkie and Denise Withnell, Paul Rumbolt, Berna-Dean Holland, Tom Cole, Cowboy Celtic, Hugh McLennan, Sid Marty and Wailback, Steve Fisher and others. He is also in demand as an instructor and guitar clinician, teaching private lessons, at music camps, and presenting guitar workshops and clinics. His personable and encouraging temperament puts students at ease and facilitates both the transfer of knowledge and the building of confidence in his students.